Library image #2615: Taken during University of Montana summer 2008 volunteer weed inventory study. The United States Congress designated the Gospel-Hump Wilderness (map) in 1978 and it now has a total of 205,395 acres. All of this wilderness is located in Idaho and is managed by the Forest Service. The Gospel-Hump Wilderness is bordered by the Frank Church-River of No Return Wilderness to the southeast. Long before explorers Lewis and Clark first laid eyes on this region in 1805, Nez Perce Indians were hunting the elk, deer, and black bears whose descendants still roam here. Discovery of gold in the 1860s brought a flood of miners into central Idaho that didn't subside until after the turn of the century. Another brief gold rush occurred during the Great Depression, remnants of gold mining operations are evident. Elevations in the Gospel-Hump Wilderness range from 1,970 feet at the Wind River pack bridge on the Salmon River to 8,940 feet at the summit of Buffalo Hump. The northern portion contains relatively gentle, heavily forested country that sweeps up the glaciated divide between the South Fork of the Clearwater River and the lower Salmon River, which flows out of the nearby Frank Church-River of No Return Wilderness. 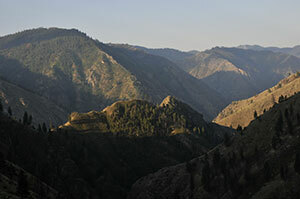 From the divide, the terrain becomes the steep and sparsely vegetated along the Salmon River Breaks. Moose, mountain goats, bighorn sheep, mountain lions, wolves and anadromous fish live here. The area sees extreme variations in weather, with temperatures sometimes soaring to 100 degrees Fahrenheit along the Salmon River while snow whitens the high country. Seasonal roads of fair to poor quality surround the Wilderness, offering access to trails that lead from the Salmon River Breaks into the high country, which many hikers would classify as very challenging, and are often impassable due to late snows. Planning to Visit the Gospel-Hump Wilderness? How to follow the seven standard Leave No Trace principles differs in different parts of the country (desert vs. Rocky Mountains). Click on any of the principles listed below to learn more about how they apply in the Gospel-Hump Wilderness.